We all love to travel, exploring different countries and cultures around the globe. But when we can't travel ourselves, the next best thing is to experience travel vicariously through the words and photos of others. Our first Travel Saturday, Write Around the World will include a panel of writers and journalists talking about travel writing, how to transform observations into works of fact and fiction, and their own areas of interest including spirituality and travel, the 'crisis' in travel writing and the effects of cultural tourism. Write Around the World is guaranteed to stimulate both your travel bug and your creativity. Walter Mason is a travel writer, speaker and brilliant raconteur with a special interest in spirituality. 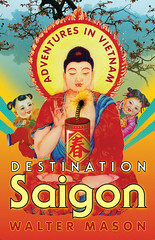 His book 'Destination Saigon' gives us a taste of the real Vietname and its people on a sometimes funny journey from the bustling cities to out-of-the-way villages, visiting Buddhist monasteries and travelling along the Mekong. Walter first visited Vietnam in 1994 and has been back 11 times since. Author and journalist Brendan Shanahan travelled through Turkey's secretive east, where he found himself in the middle of a gunfight and was propositioned by a gang of teenaged boys. Brendan's book 'In Turkey I am Beautiful' has been described as "laugh-out-loud funny" and is an affectionate portrait of a country and a people on the edge. Erin O'Dwyer is an award-winning Australian journalist, a feature writer for the Sydney Morning Herald and a UTS lecturer. Erin examines our search for an authentic cultural experience and the impact that has on fragile cultural destinations. Erin poses the question: "Are we killing the very cultures we travel to see? How can we travel in a way that is not only environmentally sustainable, but culturally sustainable?"